Perhaps it was the beauty of the mountain and trees in a small town in France that pulled me in. Or maybe it was Catherine Parkstone, a divorced woman from England who decides to move to the small town that got me. And then there was also the feel of the needle that I felt in my hands as Catherine works on tapestries and divans and builds her little business in France. What an extremely nice and pleasant read I had, walking along through the world of Rosy Thornton's story, The Tapestry of Love . Catherine Parkstone has left her life in England and moved to France, to start anew and set herself up in a small business as a seamstress. Her children are fully grown, and Catherine knows that the time is now to find her place in life, her true place. You're not from here. Says the man on the road in the middle of the storm to Catherine...but she is valiantly taking one step after another. She encounters quite a bit in her new home and town, with her eccentric neighbors (oh, how I adored Monsier and Madame Bouschet! ), and her attempts to understand the requirements of setting up a home based business in France are quite endearing. Her daughter is a free-spirited writer, her son is a quiet scientist, and her sister Bryony is a top-notch partner at a law firm, and each of them are part of her lives either by visiting or calling her (which even the phone system is one that Catherine has a bit of interest in trying to figure out in the quiet French country). And as Catherine attempts to live her life by a specific routine, her neighbor Patrick has entered and has placed a slight bit of anticipation and question in her life. When Bryony comes to visit, it certainly throws things for a bit of a loop. This story is about life, relationships, and finding your own place amongst it all, and being able to find it even a bit later in life. You are on your own, your children are grown -- there is no more obligation other than to yourself. Your identity is one to now make separate of everything else, without anyone else "taking care of things." It is now up to you, and in this story, it is now Catherine's choices all on her own. Catherine is a lovable character and there were moments when my heart broke for her as I felt for her quiet strength as she interacted with her family and especially as she dealt with her loving, yet goal-oriented sister. I enjoyed the images of the rolling countryside of the South of France that went through my mind and I eagerly hopped onto the Internet to Google Le Cevennes. This was my first Rosy Thornton novel, and I shan't expect it to be my last. OH MY .... it is a dream of mine to live in England for at least six months so that I can really get to know the people and the culture (not that it is possible in six months - but that woudl be a nice chunk of time). My second favorite place to really settle for while would be France. I was a French major and have always been a Francophile at heart. Obviously I MUST read this book!! Sounds like a fun read! But I just have to ask . . . did the author's corny name bother you? (As in, "every Rosy has its Thornton . . . ") Or is it just me? I wonder if that's a pseudonym or her real name? Sounds great. Thanks for this great review! Sorry about my name, Kathy! An ill-favoured thing, but mine own. Glad you enjoyed the book, Natalie. I loved this book too - and as a friend of Rosy, I (and thousands of her students) can assure you it's her real name! This sounds fascinating. Thank you for the lovely review. The book sounds so lovely and what a gorgeous cover! I always have that fantasy about pulling up stakes and moving somewhere...maybe one day. Wonderful review Natalie! It sounds like a perfect, comfort read and a great way to do a bit of armchair traveling right? I read Rosy's book, Hearts & Minds, a couple of years ago and it was really good. I know there's another one she has that I've been meaning to get my hands on so now I'll have to add this one too. @ Molly -- Six months is a wonderful amount of time to entrench in a culture, I feel! And ah, England, how I adore her! :) I think you might really enjoy this, do let me know what you think of it! @ Kathy -- :) It is quite a fun read!! I think you'll enjoy it!! @ ham1299 -- Thanks for stopping by, please do join me again! @ Bibliophile by the Sea -- I'd love to know your thoughts, I really did enjoy this quiet and pleasant read. @ Peppermint Ph.D. -- This is exactly one to curl up with, rainy day in the background especially! @ Rosy -- What a pleasure to have you stop on by! Thanks a bunch, and I really enjoyed the read!! @ Brenna -- Thanks so much for stopping by! @ Bermuda Onion -- I know, I agree -- the cover is absolutely gorgeous!! @ Iliana -- Yes, you got it, here we go again with our armchair traveling, huh?! :) I haven't read Hearts and Minds, but I daresay I will need to now!! LOve the cover and so glad to hear it is a wonderful read too! Oooh! 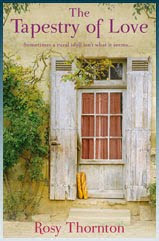 I'd love to roll through the countryside of Southern France again. It's been too long! Sounds lovely! I really enjoyed Thornton's Crossed Wires -- be sure to pick that one up! I would not normally have considered this based on the cover styling, but I do love a novel set in France and that ensemble cast and especially the eccentric neighbours sound wonderful. Hadn't heard of Rosy Thornton before either, might have to check her out. what a beautiful review! the imagery of pulling the needle through the fabric and walking along the road...i want to jump into the book right now! fantastic review! i look forward to more Rosy Thornton reviews from you!!! This sounds like a lovely read. I haven't heard of it before, but I will be looking for it. Happy Reading! So glad you enjoyed it! I loved it too, but probably my favourite Rosy Thornton novel is Hearts and Minds. It's set in Cambridge and concerns the university and it is very true to life! This sounds like a lovely little book, I'll be adding it to the wishlist. @ Sheila (Bookjourney) -- The cover is a pretty work of art, I agree! @ Meg -- Thanks for the tip, I will definitely pick up that one! @ Booklover Book Reviews -- Do let me know what you think when you read this! @ Stacy at a Novel Source -- I look forward to more of her books as well, I was really so pleasantly surprised. Such a nice read, and I really enjoyed it! @ Jennifer @ Mrs. Q: Book Addict -- I'd love to hear what you think after you read it, let me know! @ litlove -- I really have to pick up Hearts and Minds, I have heard so much about it! @ Amy -- Let me know what you think, it's always good to have a chat!